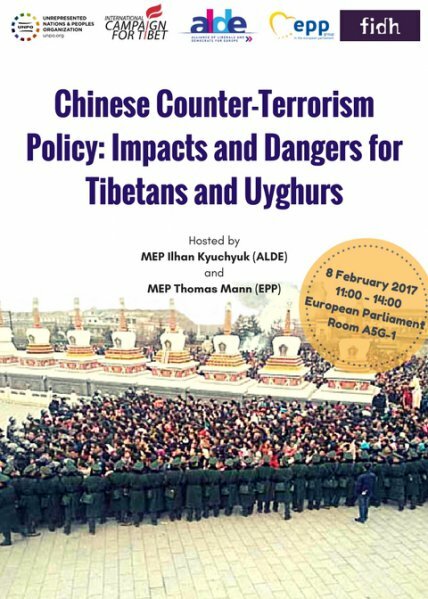 The Unrepresented Nations and Peoples Organization (UNPO), in collaboration with the International Campaign for Tibet (ICT), the International Federation for Human Rights (FIDH), MEP Ilhan Kyuchyuk (ALDE) and MEP Thomas Mann (EPP), will be convening a conference at the European Parliament entitled ‘Chinese counter-terrorism policy: Impacts and dangers for Tibetans and Uyghurs’. The event aims at raising awareness amongst Members of the European Parliament over the risks the new Chinese counter-terrorism law represents to human rights (an in particular on the rights of religious groups such as Uyghurs and Tibetans) and effective counter-terrorism in China as well as globally, and at discussing the ways the international community, including the European Parliament, can address these challenges, in order to ensure that China’s counter-terrorism approach does not result into more violence. On 27 December 2015, the Standing Committee of the National People’s Congress, China’s top legislative body, adopted a law on counter-terrorism, one of a recent package of laws on national security. This new law, which came into effect on 1 January 2016, has a number of significant implications, covering major issues such as terrorism designation, prevention, intelligence gathering, investigation, emergency response, international cooperation, safeguards, and legal liabilities. There have been mixed reactions to the law, and a range of concerns raised both within China and from the international community about its implications for business, trade, data privacy, civil society and media, and particularly on human rights. As highlighted in a recent report by FIDH and the International Campaign for Tibet (available athttps://www.savetibet.org/dangers-of-chinas-counter-terrorism-law-for-tibetans-and-uyghurs/),the new law, in conflating ‘terrorism’ with an undefined ‘extremism’ linked to religion, indeed gives scope for the penalization of almost any peaceful expression of Tibetan or Uyghur identity, acts of non-violent dissent, or criticism of ethnic or religious policies. Moreover, Pro forma references in the counter-terrorism law to human rights and the ‘protection of ethnic culture’ are rendered meaningless given the broad powers assigned to the authorities by the law and the absence of independent judicial oversight over restrictive measures that can be applied. Overall, the new legislation and its implementation are believed by many to be provocative and deeply counter-productive, with fears that it is likely to heighten tensions and increase the risk of violence through individuals feeling they have no other recourse or nothing to lose. At the same time, China’s growing interest in cooperating on counter-terrorism initiatives with other countries and intergovernmental agencies represents an opportunity for governments and international organizations to challenge the risks and human rights violations of China’s new counter-terrorism law, and to insist on a review of the law and of China’s overall counter-terrorism strategy. Click here for the conference programme and here to register.